Thanks so much for making more of these. Unfortunately I cannot remember the rules of the puzzle. Is it just to make the required shape connecting any of the dots or must there be a certain number of dots inside/outside the puzzle or ?? I’d love even more – will definitely try these with students! Thanks in advance for letting me know. I’ll add some rules. Thanks for the feedback. Did you know there is an app with similar puzzles? It is called “Pythagorea”. I think you’d like it! Excited to check out that app! Working on a set of puzzles for elementary kids and thinking about making more with some of the more basic shapes. I have not made an answer key (on purpose). I’d rather that we have more people continuing to talk about mathematics than just giving out answers. However…. if you are stuck on this one problem…. you might notice 4 dots in the middle of the page, toward the bottom…. where two of the sides are positioned perpendicular to the bottom of the page. There will be 2 unused dots to the left of this shape… 2 unused dots to the right… and 2 unused dots above it. Ooooooohhhh…. found it 🙂 Thanks! excellent idea. the pupils enjoyed it. Thanks for sharing your slideshow. Excited that you are sharing these with others. Go for it. I’d love to see the final product. > The remaining dots are inconsequential to the puzzle, essentially they are used as distractors. Thanks for this Jacob. 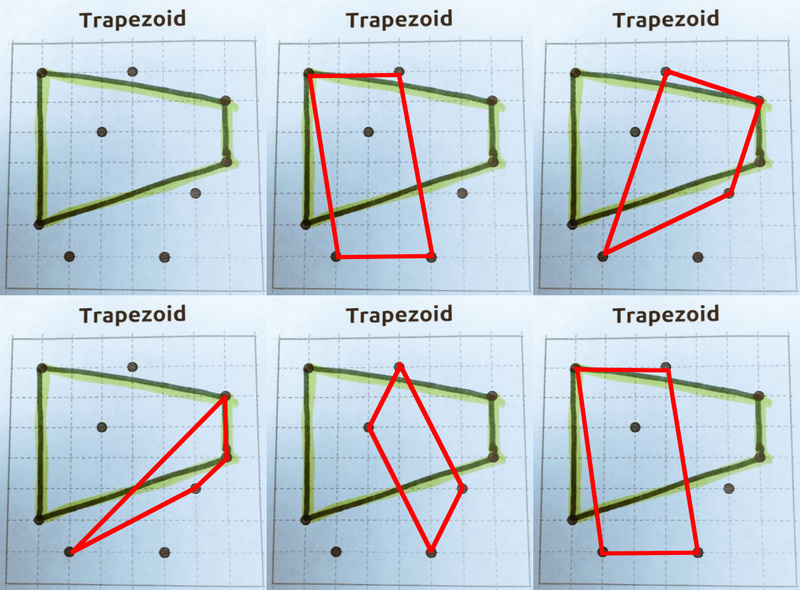 For these puzzles I have used the definition of a trapezoid which states it is a quadrilateral with 1 pair of parallel sides (meaning exactly one pair, not at least 1 pair). However, if your definition differs, I would be happy you found other answers. I am quite happy that you’ve found multiple possibles here…but for each possible answer the other points are unused. Hope that makes sense. Thanks for the pictures. In this particular puzzle, 3 of the trapezoids are also parallelograms (2 pairs of parallel sides), 1 of the trapezoids is isoceles, and 5 are scalene. Among the scalene trapezoids, 1 is a right trapezoid, 2 are acute, and 2 are obtuse. There are 6 in total matching your definition which excludes parallelograms. Whoops, I accidentally highlighted the same parallelogram twice in my images. So only 9 total by the standard definition, assuming I didn’t miss any. 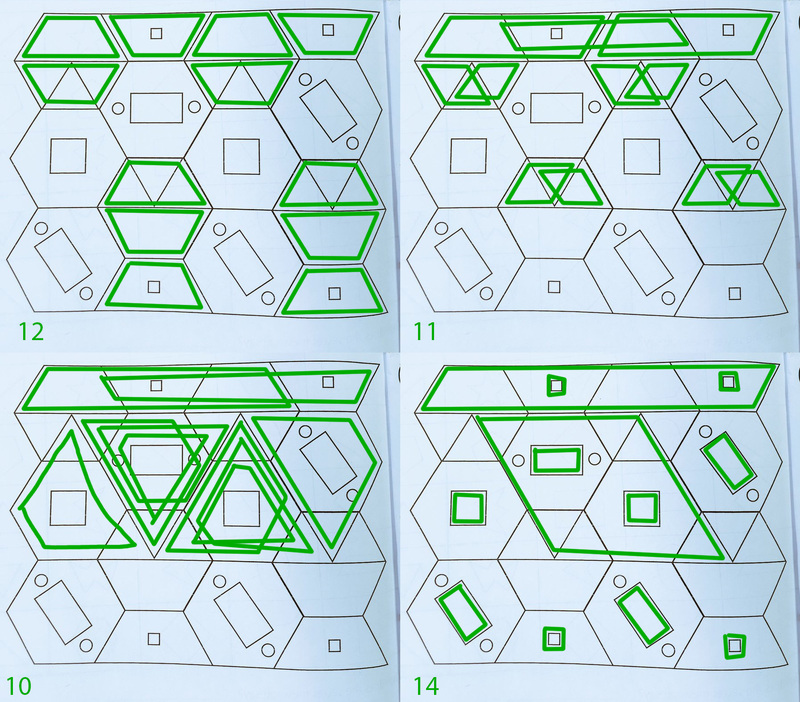 Hmmm… and I thought the hexagons might be quite interesting? Ah that’s true. If you allow arbitrary hexagons there are a whole lot. Let me try to count them for you, give me a minute.